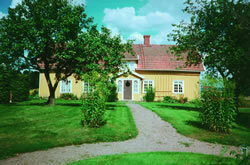 Guest accommodation in old farm cottage. Large kitchen, large toilet, shower and washer. Private patio in garden shared with host family. Organic farm with dairy cows in Viskadalen along road 41. Shop and bathing spot 3-4 km. Daytrips: Borås Zoo, Knalleland shopping centre, Varberg Castle and beaches, Gothenburg, Liseberg Amusement Park, GeKås in Ullared. From Borås: road 41, drive through Horred. 2 km after Horred, you will see a "90" sign. Our farm is on the right. From Varberg: road 41 into Västra Götaland County, cross railway 2 km. Our farm is on the left. Tree-lined road and 2 yellow houses.